Hanoi (VNS/VNA) - After the Government took steps to prevent rice prices from falling in February, prices have started to inch up in the Cuu Long (Mekong) Delta – the granary of Vietnam – though not by much. Still, the Government’s purchase of rice to stock reserves was a temporary solution. The rice industry requires more radical and sustainable solutions like establishing value chains. Following a requirement of the State Bank of Vietnam in early March, several commercial banks provided loans with three to six month terms at preferential rates of 6 percent to enterprises so they could buy rice from farmers. This helped push up prices in region by around 200-300 VND per kilo. Nguyen Ngoc Nam, President of the Vietnam Food Association, the difficulty now was seeking markets for rice consumption, especially exports. According to the Ministry of Agriculture and Rural Development, Vietnamese rice must now compete fiercely with other big producers like Thailand and India as well as emerging producers like Cambodia, Myanmar and Pakistan, who were providing a variety of high quality varieties of rice. China – the largest rice export market of Vietnam – was opening its doors to rice imports from India, Cambodia and Myanmar. Pham Van Chinh, Director of the Ministry of Industry and Trade’s Import-Export Department, said that many markets had significantly changed their rice import policies, such as increasing tariffs and allowing more rice providers to compete. Deputy Minister of Industry and Trade Tran Quoc Khanh said that countries importing rice tended not only to increase rice production by themselves but also to diversify import markets to reduce dependence on a single or several export markets. “Vietnam should have a more radical plan for the development of the rice industry,” Khanh said, adding that establishing value chains to diversify rice types and enhance rice quality was critical. Pham Thai Binh, General Director of the Trung An Hi-Tech Agriculture Joint Stock Company, said that promoting the development of a large-scale paddy field model to establish rice value chains would be an important solution. However, to do this, enterprises needed more credit support from the Government. “It is important that credit policies for agricultural and rural development are implemented efficiently. Credit policies with an aim of sharing risks and damages for participants in the agriculture production chain should also be promoted,” Binh said. 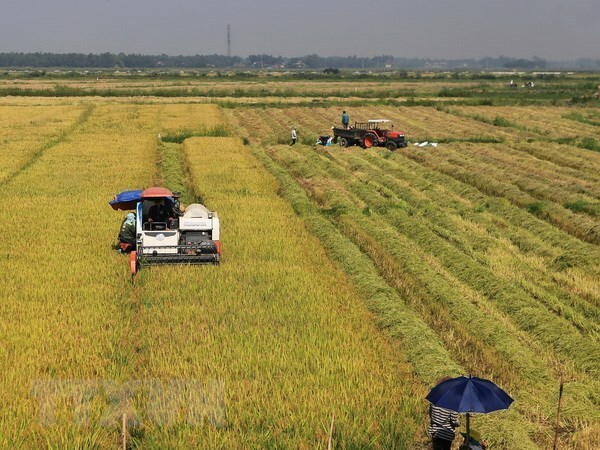 Director of Soc Trang province’s Department of Agriculture and Rural Development Luong Minh Quyet said that in the long term, the rice industry needs proper planning for raw materials. In addition, enterprises and farmers needed to be supported in terms of farming techniques, processing technologies and seeking consumption markets. Vo Tong Xuan, an agriculture expert, said that to promote rice consumption, farmers and companies must cooperate to produce rice following quality standards. Xuan also pointed out that the rice industry in Vietnam lacked key enterprises that worked directly with international intermediary firms to promote exports like Thailand. Firms and farmers also need to get updates on market information and demand for rice production, Xuan said.